Let us show you how our Microsoft Office 2007 training covers the complete suite of productivity and database software that will help you save time and stay organized. You will learn about the powerful contact management features that help you manage all customer and prospect information in one place. How to develop professional marketing materials for print, e-mail, and the Web, and produce effective marketing campaigns in-house. Create dynamic business documents, spreadsheets, and presentations, and build databases with no prior experience or technical staff. You will learn about the new features of using improved menus that present the right tools when you need them. This video course will help you work faster and create more professional documents, spreadsheets, and presentations. Learn to quickly accomplish routine tasks so you can spend more time with your customers. New task-based menus and toolbars automatically display the commands and options you can use, making it faster and easier to find the software features you need. Live Boot Camp - The MOS certification is for users who work with MS Office 2007 products: Word, Excel, Powerpoint, Access, Outlook, and Vista. The MOS is designed to target specific skills with each product. 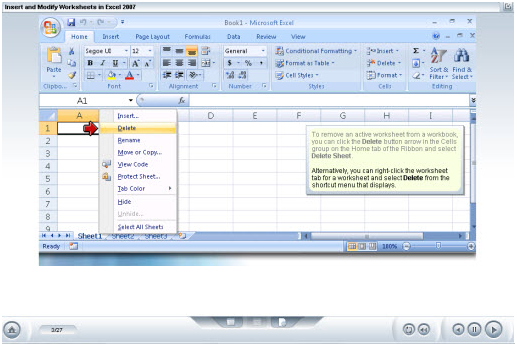 The MOS certification is a project and task oriented certification for workers who use Office 2007 products. Focus areas include managing budgets, managing presentations, and managing team collaboration.